Right now we are offering low rate finance of 1.99% P.A. * (3.08% P.A. 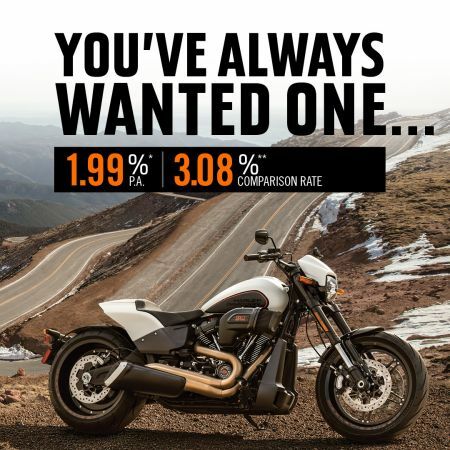 Comparison Rate**) on select new and demo Harley-Davidson® models*. Now is the time to get the bike you've always wanted, with the Finance Rate you've always wanted. *Interest rate of 1.99% p.a. is based on a secured loan for up to 36 months. Offer only available on MY18 & MY19 New and Demonstrator Motorcycles (offer excludes XG500 and XG750A and ALL CVO models) models that are purchased between 15/03/2019 and 30/04/2019 and settled by 15/05/2019. Credit provided by BOQ Credit Pty Limited ABN 92 080 151 266 (BOQC) (Australian Credit License Number 393331) trading as Harley-Davidson Finance. BOQC is a wholly owned subsidiary of Bank of Queensland Limited ABN 32 009 656 740 (BOQ). BOQ does not guarantee or otherwise support the obligations or performance of BOQC or the products it offers. BOQC’s standard credit assessment criteria apply. Fees and charges are payable. **3.08% P.A. Comparison rate is based on a 5 year secured consumer fixed rate loan of $30,000. WARNING: This comparison rate is true only for the examples given and may not include all fees and charges. Different terms, fees or other loan amounts might result in a different comparison rate. Terms and conditions available on request.